I'm so excited! I FINALLY have a plan for my next strings quilt top! It has stymied and bothered me for some time now and without a plan I have been pretty unmotivated. I know I could just make blocks, but it's not the same when you have no idea where you area going. Here it is: And I'm excited about it! Yes, I am! Now I can hardly wait to work on colorful strings again! But this weekend I didn't. I've been doing other things. 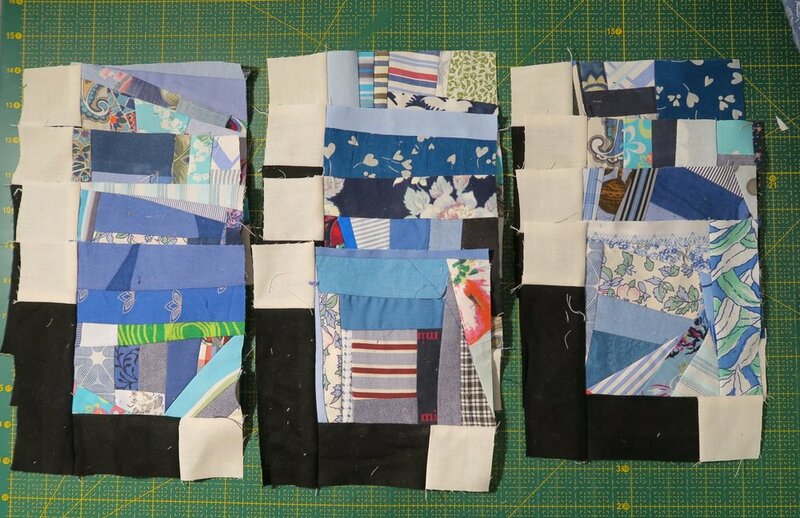 But I did make 12 upcycled blues crumb blocks - and then I managed to get the shadow on them, but I didn't get them put together in rows. I'm actually "feeling" a difference in the amount of upcycled blues scraps in that very large bag. I am not anywhere near close to using up all those small/odd shaped pieces that are leftovers, but at least I am starting to see a difference now. The pieces for these are pulled from my so far uncut scrap bag that is located near my sewing machine. These are the newly finished blocks. 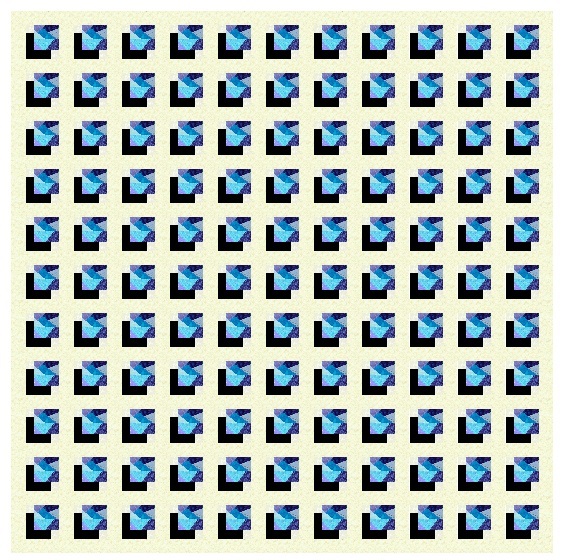 For those of you who are interested, they are called Woven Star blocks and it is a free download from Andover Fabrics. These are my finished star blocks. 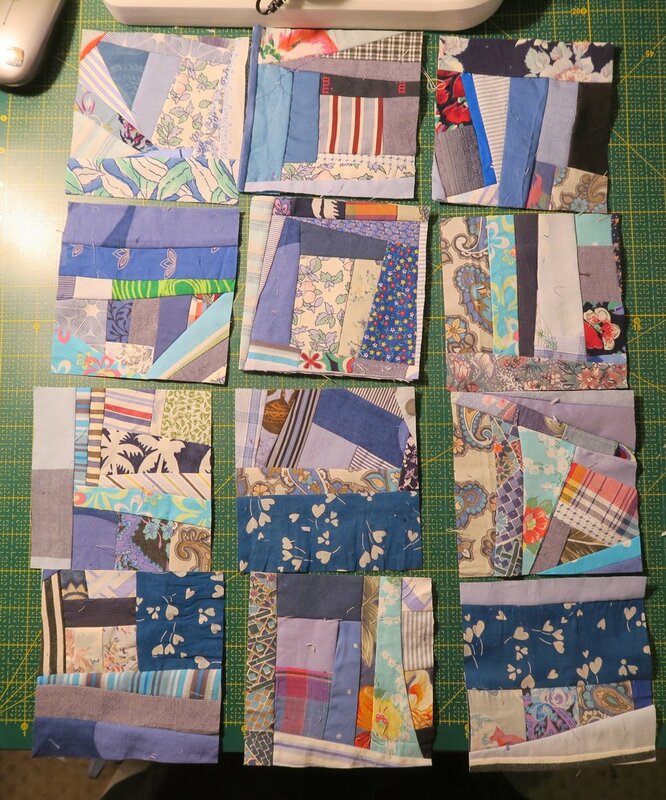 When I finish about 100, I may start putting them together as foursomes and make one whole star block. These are currently 6 1/2" and the block will finish at 12 1/2". And that's all I did this weekend with regards to my strings and crumbs! I trust you have a wonderful day whenever this finds you! Don't forget - if you need something for your current sewing project, be sure to check first with my sister! She may have just what you need!